The all out war between Vegans and Vegetarians – is it real? Oh okay, there isn’t one, I just needed to grab your attention. 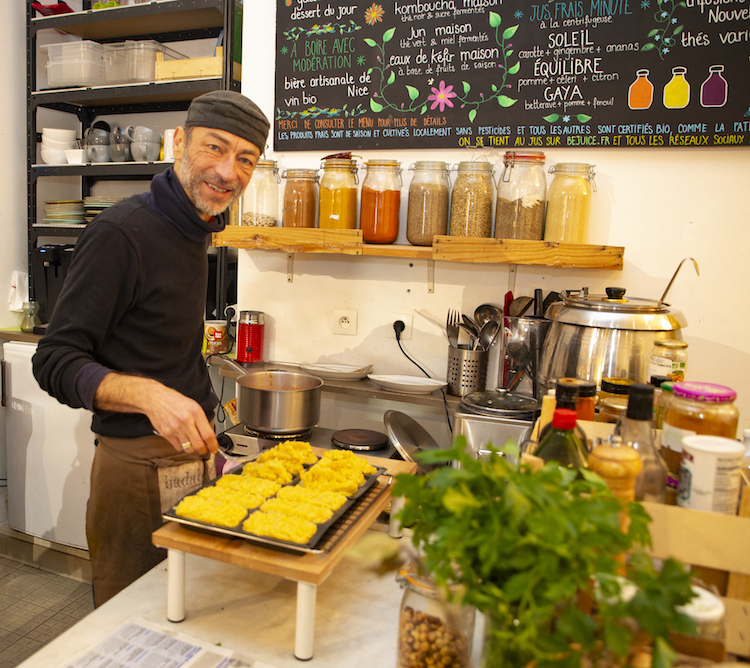 Francesca is opening her Vegetarian Utopia restaurant with mainly vegan dishes a stone’s throw from Badaboom which is Barbara & Nicolas’s extremely popular vegetarian restaurant. Does this mean outright war? Do Vegans and Vegetarians actually fight? No, of course they don’t! But, this obviously means severe competition that could impact each restaurant commercially, doesn’t it? Hmm, let’s think about that. At 11 rue Francois Guisol close to the port of Nice lies Badaboom. 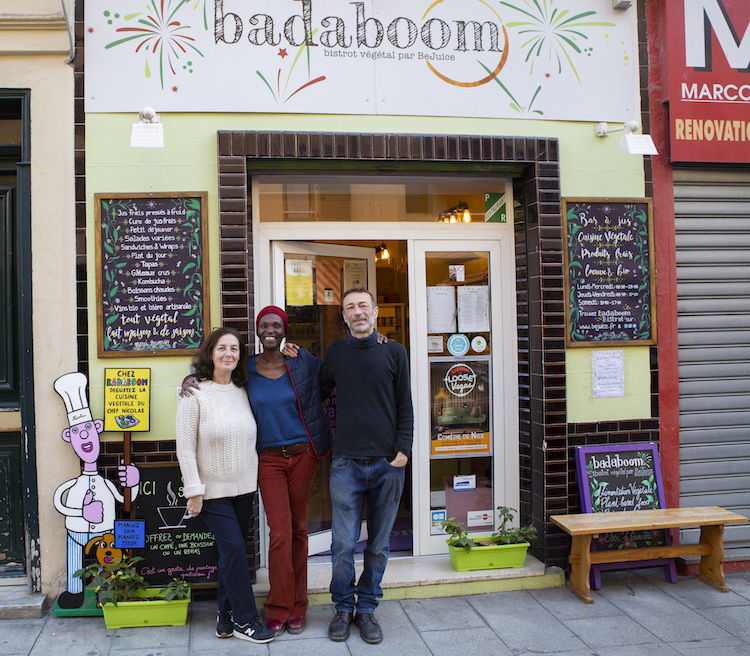 Badaboom is a relaxing tranquil oasis that brings people together. It organises events like Nice Plogging, an energetic weekly happening set to clean up the streets of Nice. It’s a community builder. Their Everyday Earth project attracts many people to a stream of events. Oh the food? Back to the food. 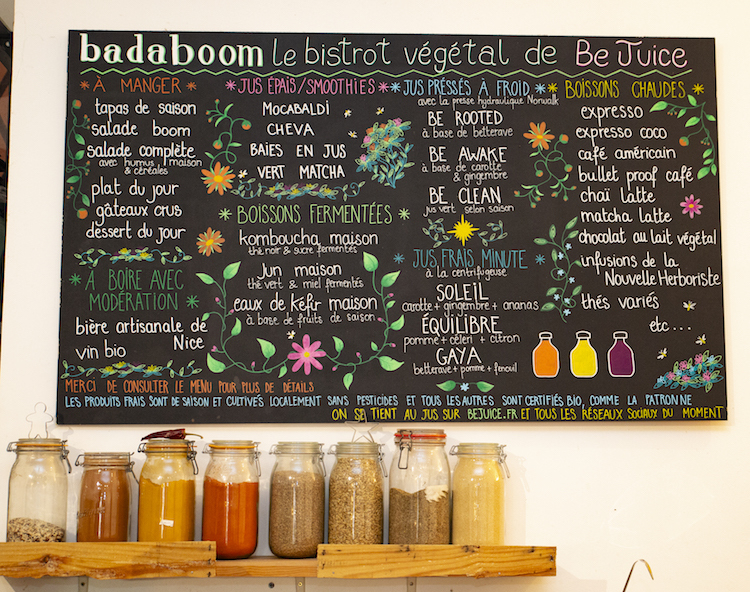 Nicolas at Badaboom produces wonderful vegetarian food that is inviting, tasty and nutritious. 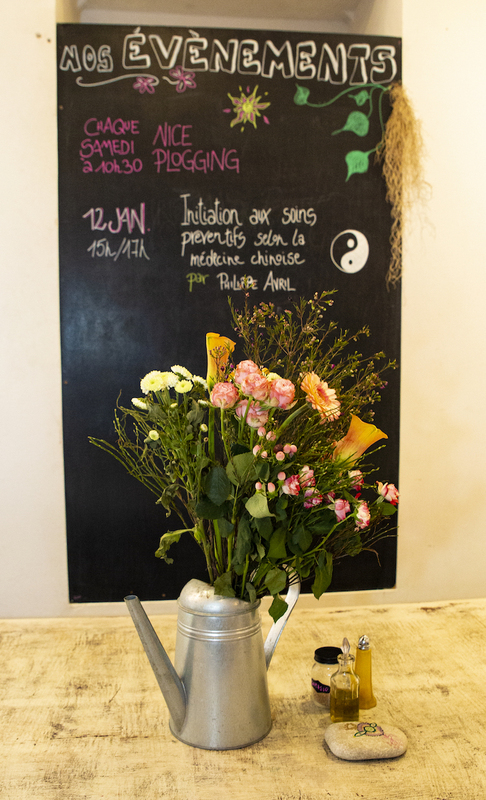 It is a daytime laid back venue that attracts people of all nationalities and backgrounds. Wandering in for a drink of something in its cool ambiance and using their WiFi is encouraged. Uniquely they have a ‘Buy it forward’ scheme where it is possible to leave some extra money for someone who hasn’t any money – now, that’s community! Oh, and don’t forget their great juices!! 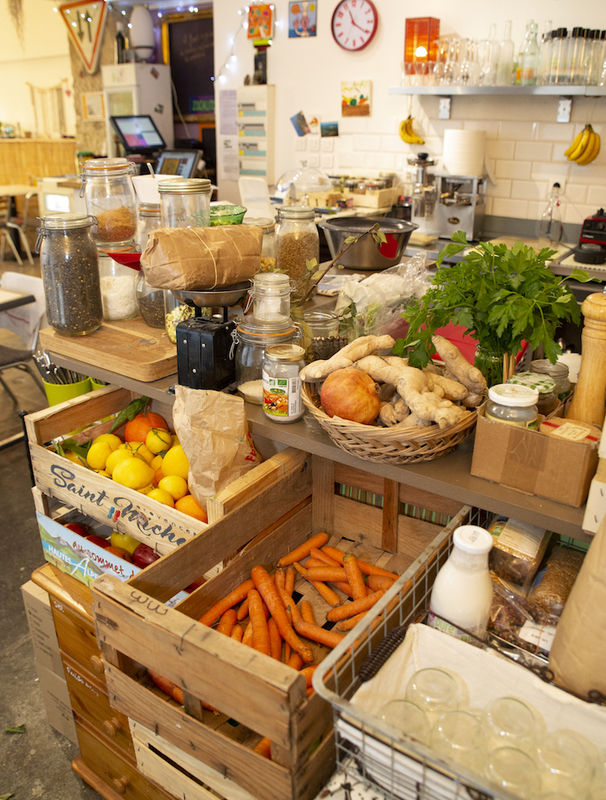 As for Utopia – Francesca is a really good Vegan orientated chef. Is she a traitor to Badaboom? Given she did a wonderful evening presenting excellent Vegan food at that very venue then yes she must be! But no, she most definitely is not. This is a community. 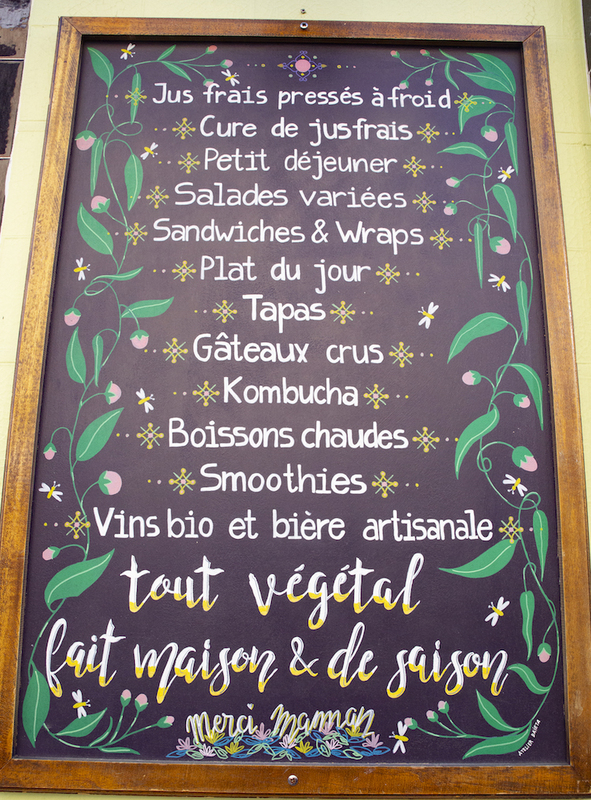 Francesca now has her own restaurant at 35 rue Bonaparte, Utopia. Can they co-exist? Yup, sure they can. They have a mutual objective which is to bring people into the community. One difference is that Utopia is a more formal dining experience which will open for lunch and dinner. There is now a choice. It’s a win win for foodies and the community. Take it from me, Francesca at Utopia creates heavenly Vegan food. I am a believer! Plus they have WiFi for those who simply have to work – they open at 8:30 so will be a great brekky spot. The good news is that there will be no war! Yay! In a country where, outside of pizza & pasta, the typical menus have dishes with one or more of the meat types, a fish one (especially Fridays) and risotto/pasta dish at the bottom if you really must have vegetarian, it is not easy to establish vegan and vegetarian cuisines into the culinary DNA of the nation. However, slowly but surely this is happening thanks to Barbara’s Badaboom and, now, Francesca’s Utopia. So a resounding ‘Cheers’ to the continuing well deserved success of Badaboom and a big welcome to Utopia. Both restaurants will make diners feel at home and totally welcome. Join the community!